A red front-facing dragon ascends from ocean waves, surrounded by scrolling clouds appearing like tongues of flame. Scrolling clouds are also shown emanating from the body of a dragon and from the pearl he chases. Clouds are among the earliest and continuously invoked auspicious symbols in Chinese art. The mystical 'cloud force' was believed to be a vehicle of the immortals. The benevolent rain-bearing dragon represents the authority and power of the imperial throne; the clouds and the waves symbolise two basic elements of the universe. Edmund Capon, The Connoisseur , 'Far Eastern Art in the Art Gallery of New South Wales', pg. 22-29, London, May 1980, 28 (illus.). Bruce James, Art Gallery of New South Wales handbook , 'Asian Collection: East Asia', pg. 246-287, Sydney, 1999, 258 (colour illus.). See Further Information for text. Jacqueline Menzies, Art Gallery of New South Wales handbook , 'Asian', pg. 72-93, Sydney, 1988, 77 (colour illus.). Richard, Cradles of Civilisation: China , "Ming and Qing Society: China and the West", J. Smith, Norman, Sep 1994, 163 (colour illus.). Art Gallery of New South Wales picturebook , Sydney, 1972, 139 (colour illus.). 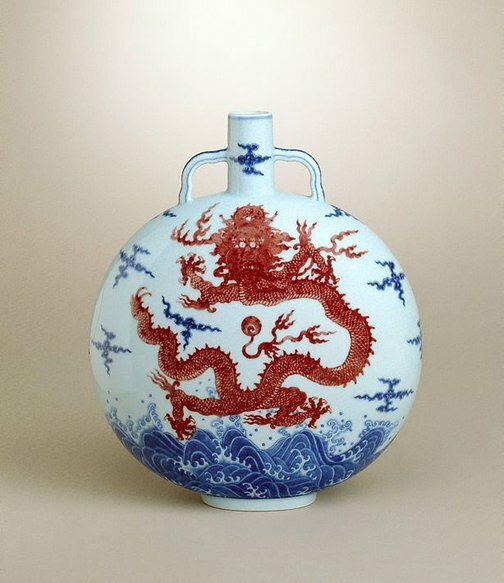 Asian Collection Handbook, Art Gallery of New South Wales , 'Chinese Porcelain', pg. 30-41, Sydney, 1990, 39 (colour illus.). Chinese porcelain of the Ming and Ch'ing dynasties , Sydney, 1977, 31. cat. no. 59. The Asian Collections Art Gallery of New South Wales , 'The Marvel of Porcelain', Sydney, 2003, 127 (colour illus.). Adventures in Asia. An education kit for the Asian gallery , Sydney, 2003, cover (colour illus. ), 5 (colour illus.). card no. 5; the colour illus. on cover is a detail of this work.